Finalists 2017 at the Paris Air Show with Olivier Dassault, Eric Schulz an Michel Dubarry in front of a Falcon 900LX. The ORAJE network is expanding with the integration of the 12th promotion made up of the finalists of the USAIRE Student Awards 2017. 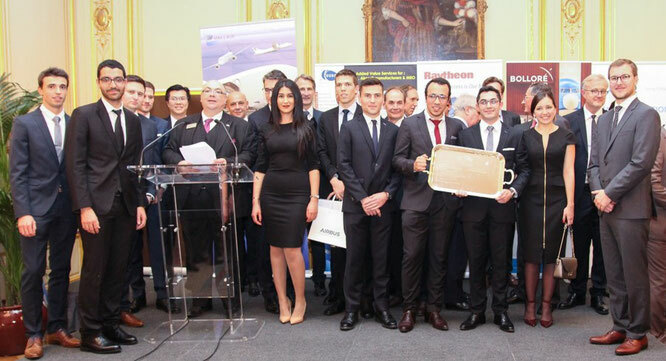 This first meeting, at the International Paris Air Show, permits us to measure the extent of the organization as well as the diversity of the profiles that compose it. It is in the heart of the Paris Air Lab, a space devoted to technological innovations for aeronautics and space that we gathered around Michel Dubarry, Executive Vice President of USAIRE. All the actors of digital innovation were present: collaborative initiatives from large groups to start-ups and research centers. It was in this stimulating atmosphere that the conferences on the reduction of costs by digitization began. To develop a global approach we had the opportunity to interact with the main stakeholders of this revolution. 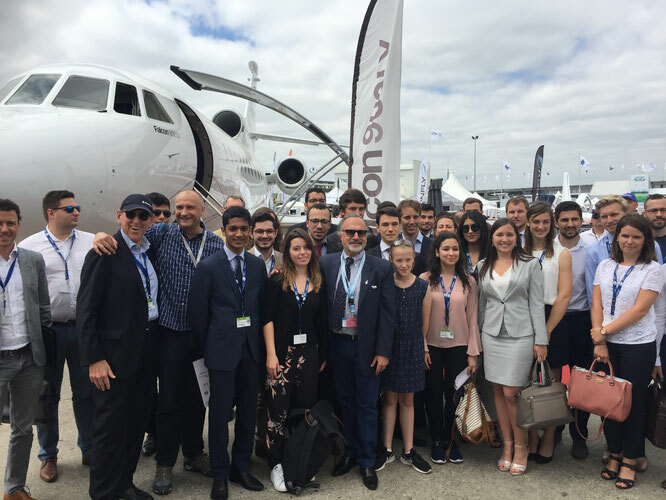 The ORAJe members were then welcomed on the Dassault Aviation stand by Olivier Dassault in person. After a few words exchanged, we had the chance to experience an immersive experience by embarking on board a static Falcon 900LX. After this highlight, we followed the pilot's performance with the in-flight demonstrations. The seminar continued on the stand of Air & Cosmos, leader in aeronautics and space news. Digitalization is indeed at the heart of the issues of the weekly magazine with the setting up of the employment platform Air & Jobs as a reference for the recruitment of the aeronautics sector. To close this day, Pierre-Alain Goujard, winner of the Student Awards 2016, shared the key factors of his previous success. This first experience USAIRE / ORAJe, raises our stature ad experience, thanks to the speeches of our interlocutors. The main strength of the seminar is finally to lead to an awareness of the stakes and strategies of companies, linked to the issue raised by the contest. Laureates 2017 at the Thanksgiving dinner.